Today’s media fills every corner of the room, making versatility a top concern for contractors and system integrators. From the classroom to the conference room to portable exhibits, floor and table boxes help fulfill this need, making multimedia communication as seamless and plug-and-play as possible. Whether connecting multiple microphones, loudspeakers, video connectors, or laptops on the table or in the floor, the latest solutions are designed with online accessory tools; they smoothly hide from sight and accommodate an ever-wider range of connection modules. The C2N-FT-TPS4 FlipTop touchpanel control center mounts in any tabletop surface. The lid flips open to access a color touchpanel and keypad. A built-in cable storage compartment keeps interface cables ready for plugging in computers, AV sources, and other devices. A 3.6-inch active matrix color touchscreen is integrated into the FlipTop lid and provides a fullycustomizable user interface for controlling AV, lighting, and other functions. The C2NFT- TPS4 produces 3D graphics, dynamic text, and full-motion animations complete with WAV file audio feedback. Ten programmable pushbuttons are also included; they feature translucent buttons with white LED backlighting. When the lid is not fully open, the touchpanel and buttons are disabled to prevent accidental selections. A pull-out cable storage device supports a range of applications and signal types to provide extensive connectivity. There are eight grommeted holes in the bottom plate for virtually any type of AV, communication, control, or data cable to pass through. The user end of each cable stows within the FlipTop compartment. An AC power receptacle is also included. Cresnet and ethernet are standard for network integration and communication with Crestron control systems. 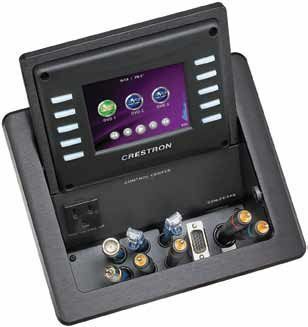 This universal box can be paired with a Crestron DigitalMedia transmitter to bring HD content over a single wire. The T6-AC3 table box is an expandable unit designed for a conference room environment. The unit’s connector cavity is made up of three integral AC outlets to suit most tabletop requirements, and isolation from low voltage sections provides built-in safety measures. Adding a simple bracket expands the T6-AC3 to six outlets. The table box can be populated with FSR’s Intelligent Plate Solution (IP S) inserts, cable-pulls, or snap-in connector brackets for customized configurations. Other features include a multi-tiered, plate-stacking arrangement and overall depth adjustment. The unit’s cover can close while in use with cables exiting through the milled openings. The T6-AC3 is available round or square shaped with black anodized, clear anodized or brushed brass finishes. Both shapes fit in a six-inch round hole. The standard unit features a chassis, three-AC outlets bracket, and either one large or one small bracket. The HydraPort cable connection system is a modular, retractable unit designed for the varied needs of conference and meeting room applications. Users can connect and control laptops, projectors, document cameras, DVD players, audio equipment and other support devices. The system has global capability with power modules that meet standards for the U.S., U.K., E.U, Australia and India. Both sides of the HydraPort accommodates eight AV or data modules, four power modules, two keypad modules or any combination of them. HydraPort is supported by an interactive web application available on AMX.com, the HydraPort Connection Preview (HCP). HCP guides installers through building a connection port for a specific project. HCP monitors space allocation to warn of potential compatibility and capacity conflicts. Installers can save their configurations on HCP to revisit them later. Other features include a printabled visual reference of the configuration layout, and a parts list of every piece needed for an order. The CCBBS Series of small ballroom floor boxes are designed for above-grade and on-grade concrete floors, withstanding the heavy loads found on wheeled vehicles in hotel ballrooms, exhibition halls, convention centers, entertainment venues, and museums. The boxes feature rugged construction, heavyduty cast aluminum covers tested to meet 25,000 poundstatic loads, and full capacity for AV devices from a range of manufacturers. The cover has a self-closing handle allowing it to rotate 180 degrees for full access to the box’s interior. Two large cable egress areas provide space and flexibility for wires and cables. The floor box compartments and devices are protected from water, dirt, and debris by Legrand’s TopGuard protection feature.